.. this is likely the gravestone recorded on the c. 1939 Town of Brookhaven Historian's Inventory as Jane Rimmington. The David Hulse Cemetery is an approximately 60 x 68 foot plot located on the west side of Fire Place Neck Rd. in Brookhaven Hamlet, Brookhaven, Suffolk, NY. Sometimes it is referred to as the "King David" Hulse cemetery -- I am unsure why. The cemetery was inventoried in March 2003, and transcribed and photographed with the assistance of Richard Thomas. Overall, the cemetery is in good condition. Only a few of the visible stones have deteriorated to the point of being unreadable. Some maintenance is provided by the Town of Brookhaven and local residents. It is cemetery no. 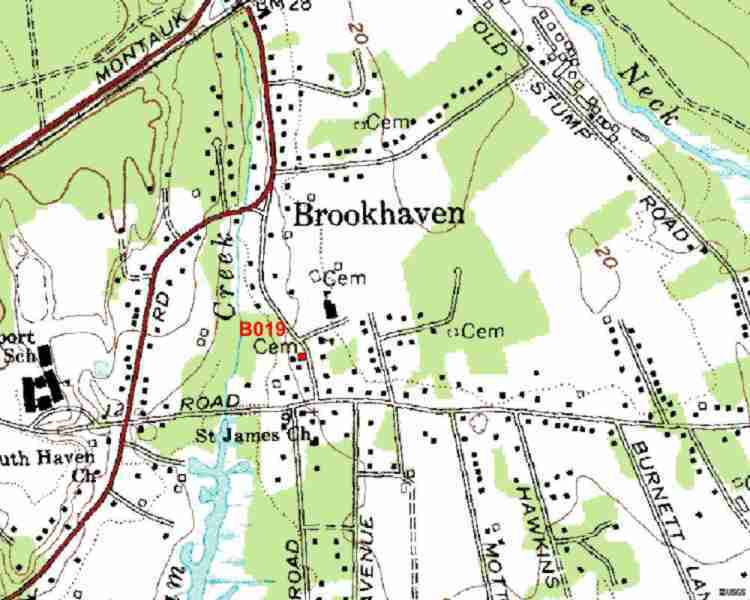 19 on the 1939 Town of Brookhaven's inventory of cemeteries. All the stones on the Town survey can still be found, although a few have since become unreadable. There are additional stones not found on the Town survey. David O. Hulse, after whom the cemetery is named, appears to have two monuments. Stone No. 2 may have been his original monument and marks the location of his interment. The second stone, no. 6, also contains the memorial to his wife, and was probably erected by their children. This cemetery has Brookhaven/South Haven Hamlets Historic Sites Ref. ID Br31A. Description revised 5 September 2008.